The Study to Explore Early Development Phase III, or SEED III, is a five year, multi-site collaborative study that will help identify what might put children at risk for autism spectrum disorders (ASDs) and other developmental delays. It is being conducted by the Centers for Autism and Developmental Disabilities Research and Epidemiology (CADDRE) Network, which includes six study sites, a data coordinating center, and a laboratory partner. What are the sites that are participating? The CADDRE Data Coordinating Center is operated by Michigan State University. The CADDRE Laboratory is operated by Johns Hopkins University. Be born between January 1, 2014 and December 31, 2017 and be between 2 1/2 and 5 when they are in the study. 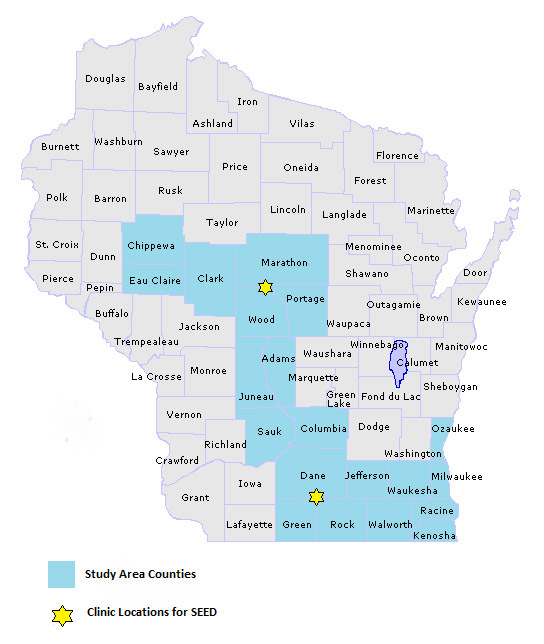 Be born and currently live in one of the following counties: Adams, Dane, Chippewa, Clark, Columbia, Eau Claire, Green, Jefferson, Juneau, Kenosha, Marathon, Milwaukee, Ozaukee, Portage, Racine, Rock, Sauk, Walworth, Waukesha, or Wood. Be living with their biological mother. Child and mother must speak English. Child must be able to walk, see and hear unaided. Why is the study only looking at children between the ages of 2 1/2 and 5? This age range was selected to reduce the amount of time since pregnancy and early development so that parents can remember the events during these time periods better, so medical information is easier to retrieve, so families are less likely to have moved away from the study area and so it will be near the beginning of treatment for children in developmental intervention programs. I know someone who would be interested in signing up for this study. How can I refer them? If you know someone who meets the study eligibility criteria and is interested in learning more about the study you may have them call the SEED Helpline at 1-888-814-5394. Families who refer themselves must have an eligible child who has a diagnosed Autism Spectrum Disorder or developmental delays involving communication and social skills. My child doesn't have autism. Why does the study want my family to participate? It is important that we work with a wide range of families in order to gain an accurate understanding of child development. For that reason we are asking all kinds of families to participate. What are the other developmental delays being studied? We will be studying a range of other developmental delays including mental retardation, language delay, general developmental delay and other behavioral problems of early childhood. Does this study involve treatments, intervention, or medication? No, this study does not include any type of medical treatment, intervention, or medication. We will be studying the characteristics of children and families to learn more about the causes of autism and other developmental delays. This may lead to better services and treatments for children with developmental issues. Does my child have to have blood drawn? Do I have to do all the study activities? There is no longer a blood sample drawn for SEED. Instead, we collect saliva only. You can refuse any study activity, and still participate in other study activities. Where is the developmental assessment done? The assessments are conducted at the University of Wisconsin-Madison’s Waisman Center, as well as at the Marshfield Clinic in Marshfield, WI – whichever location is more convenient for families. Will families get any results from the study tests? For families that complete a clinic visit we will send a letter explaining the results of the developmental evaluations performed during their study visit. One of my child's biological parents is unavailable. Can my child still participate? We encourage both biological parents to participate in the study to get the most accurate understanding of the family. The biological mother must be living with the child, however if the child’s biological father is unavailable, the family may still participate. Can I get the study results? Study results will be released to the public as soon as they become available. Because the study involves so many families we will be collecting data for a five year period. After that, the data will need to be analyzed. Once data analysis has been completed the results will be reported. Some analyses may be conducted before the study data collection is over and those results can be released earlier. How do I know my family's information is protected? The CDC has received a Certificate of Confidentiality which guarantees that any information collected that could identify you or your family will be used only for this study. Your information cannot be given to anyone else unless you give your written consent or unless otherwise required by law. In addition, each site must follow security and confidentiality regulations set up by the federal government and the local Human Subjects Protections Committees. Who can I contact if I have questions about my rights as a research participant? If you have questions about the study, please call Leslie Seltzer, PhD at 1-888-814-5394. If you feel you have been harmed by participating in this research study, please contact Maureen Durkin, PhD/MPH or Leslie Seltzer, PhD at 1-888-814-5394. If you have questions about your rights as a research participant you can call the UW Health’s Patient Relations office at (608)263-8009. Routine questions about scheduling, explanation of procedures, or similar matters about SEED 3 should be addressed to the SEED 3 Helpline at 1-888-814-5394 or email us at WISEED@wisc.edu. I have questions about my child's development. Who can I call? Your child’s doctor is the best person to discuss your child’s development with you.